The 150-seater restaurant of Crowne Plaza Hotel at Changi Airport, boasts a show kitchen concept with chefs presenting a lively multicultural cooking theatre surrounded by beautiful ceramics sourced from the region in calming ultramarines and greens. 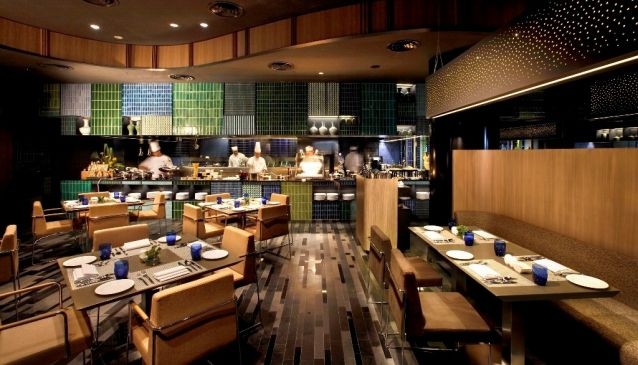 Avid foodies will be pleased to know that the buffet experienced at Azur does not compromise on quality and freshness. Every dish is prepared fresh in the kitchens of Azur and placed piping hot into the chaffers right before your very eyes. For a more indulgent dining experience, choose from our delightful Asian and Western a la carte menu, which includes mouthwatering renditions of popular dishes like Pistachio Crusted Rack of Lamb, Fricassee of King Prawn, Satay Panggang and Hainanese Chicken Rice. Azur also has a semi-private dining area for large groups.